RAX Review 2019: Is RAX a Good Hosting? RAX is a full service host that has been in business since 2001. The features are slightly more geared towards experts, however, the plans are excellent value, use a Tier IV data center, and have a 99.95% uptime SLA. RAX is a European hosting company with its headquarters in Bulgaria. A long-standing company, it has been providing hosting since 2001. The website is available in Bulgarian and English, and you can also get support in both languages as well. Firstly, RAX owns its data center (great for response times to technical issues), which is in a Tier IV facility in Sofia, Bulgaria. It’s rare to see companies with Tier IV specifications and it means you should expect less than 26 minutes of downtime per year. As such, it’s able to offer some impressive uptime SLAs, which are much more than the usual marketing strategy used by some companies. RAX guarantees 99.995% network usability, plus, if you experience anything less than 100% uptime, RAX will credit you 5% of the monthly fee paid for hosting services for every 30 minutes of network downtime. All shared hosting plans come with the usual advanced features such as FTP accounts, MySQL databases, and PHP support – surprisingly, only for version 5.3.x, as well as some slightly less common features e.g., support for Ruby, Python, Perl, and a free Cloudflare CDN. For beginners, the inclusions are slightly more lean. While there’s a one click installer for more than 250 programs, there’s no website building tool. 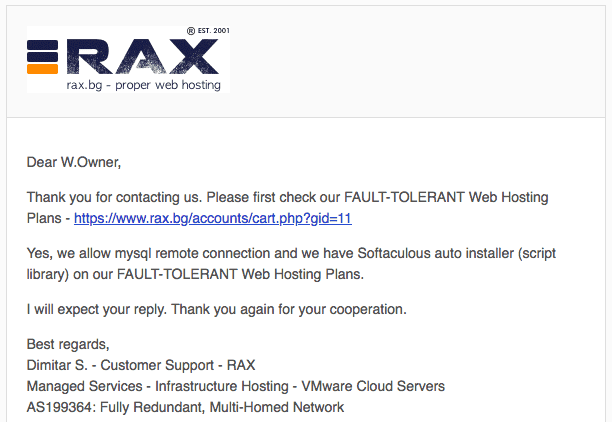 Also, RAX doesn’t take responsibility for backups, so you must make sure that you configure this on your end. Finally, what’s great about RAX is the customization options. There are base configurations for the shared hosting plans, however, there’s also a “Do It Yourself” package, which you can customize in a multitude of ways during the checkout process. Options included but are not limited to: number of domains, monthly data transfer, MySQL databases, and disk space. Given the level of resources, features, and Tier IV data center, you’d be forgiven for anticipating a premium price point. However, you’ll be pleasantly surprised when you see the prices. Not the cheapest on the market, but excellent value for money and absolutely affordable. SSL certificates and domain registration are the usual added costs to consider. The plans can’t be bought in one month terms, which is a shame, and the only contract lengths are one, two, and three years. The price does reduce with longer terms and there is a 30-day money-back guarantee. My only minor gripe is the fact that the checkout was slightly buggy for the “Do It Yourself” hosting option, however, all other options worked perfectly. Customer service is 24/7 via telephone and ticket. There’s a dedicated European number, a local Bulgarian number, and a U.S. number. If you prefer to solve your own issues, there’s a satisfactory FAQ page (it could be larger in an ideal world). My experience with customer service has been excellent. I contacted support by email mid-morning on a weekday and I received a reply within one hour, answering my question in full. RAX provides European hosting with Juniper equipment, a Tier IV data center, and a 99.995% uptime SLA. You won’t find a website building tool, nor monthly plans, however, there are tons of expert level features, all at an affordable price. 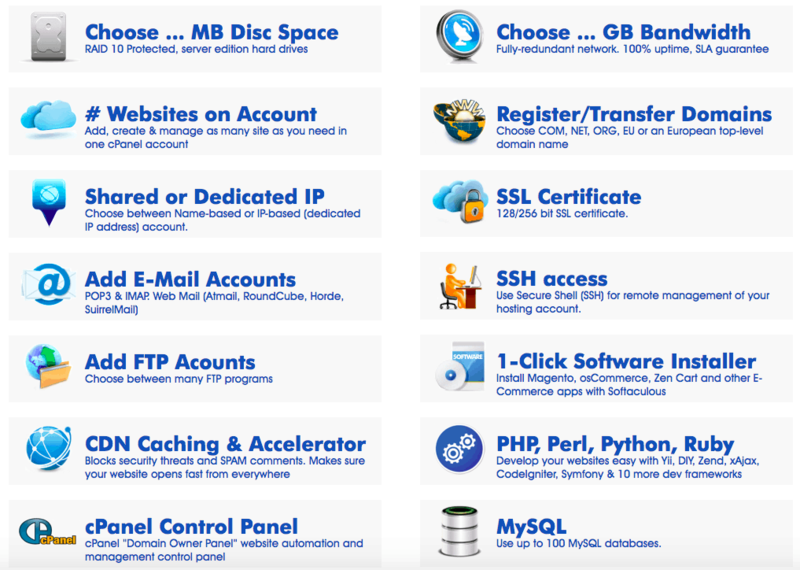 Wondering how RAX stacks up against other Web Hosting companies? Enter any other Web Hosting company and we will give you a side-by-side comparison.